I realize that many of my readers don’t “do” Halloween, we don’t really get into it but I do enjoy the costumes and drawing homemade costumes–they are fun to illustrate. 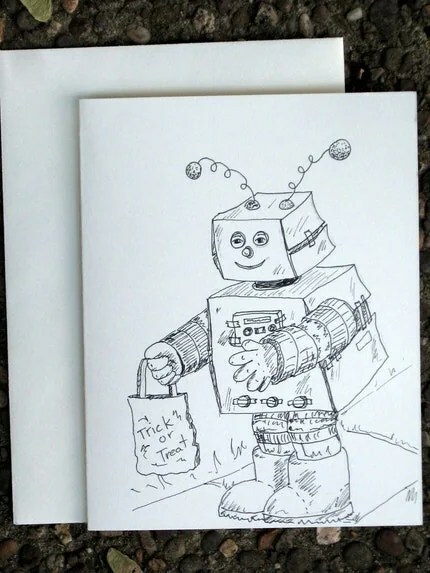 So I have done a series of greeting cards called The Trick or Treaters. You can get hand drawn versions at my Etsy store, right now they are on sale for $4 a piece (send me an Etsy conversation mentioning the sale and I will post a discounted version just for you.) These have a custom greeting (especially for those who don’t do Halloween you can say happy harvest or whatever). These can also have other costumes–ask and I will see what I can do. You can also purchase printed versions on Zazzle. Right now I only have them as full size greeting cards but if you are interested I can do them as notecards or as postcards. Just email me at gracedbychrist(at)gmail(dot)com.